I've been reading The Materials & Techniques of Medieval Painting By Daniel V. Thompson on the bus for a couple of weeks now. I'm pleasantly surprised that some of the techniques I came up with to create a pigment are listed in here. For example, I took a patina recipe on the web (salt, ammonia, & vinegar), and experimented with it until I found that using just vinegar produces the best pigment. This was done a variety of ways in Medieval times for the same reason. 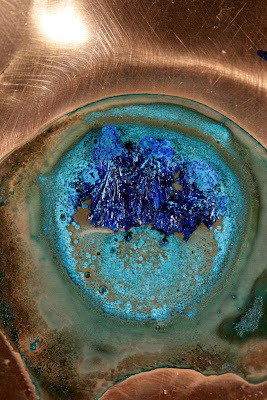 The pigment is called 'Verdigris', also described in the book as an 'acetate of copper'. The bad news is that I just did an MSDS search on the effects of Copper (II) acetate, and it is not safe at all. Here's the MSDS, and here is the wiki entry on it. I may continue to use this green pigment, but maybe it would be safer to stick with ground malchite. DANGER! CAUSES EYE BURNS. HARMFUL IF SWALLOWED. CAUSES IRRITATION TO SKIN AND RESPIRATORY TRACT. Corrosive. May cause irritation, redness, pain, blurred vision, discoloration, and damage.